They didn't have fancy ultrasound machines in 1979 so my mom didn't know if she was having a boy or a girl. Everyone just knew I was going to be a boy. My mom was gifted a lot of boy clothes. I obviously wasn't a boy, but happened to look like one from birth until about 9 months old. Putting me in what appears to be boy clothes didn't help. Thanks, Mom! This picture is from my first Christmas. I'm sitting in front of the tree at my grandparent's house. My grandparents still live in this house. I'm happy to report they no longer have this carpet. I appear to be tugging at my ears. I wonder if I had an ear infection. I have a really good memory, but can't tell you a single thing about this picture. Well, there is one thing. HOW ADORABLE WAS I?! I remember this day though. Santa brought me a Cabbage Patch Doll. 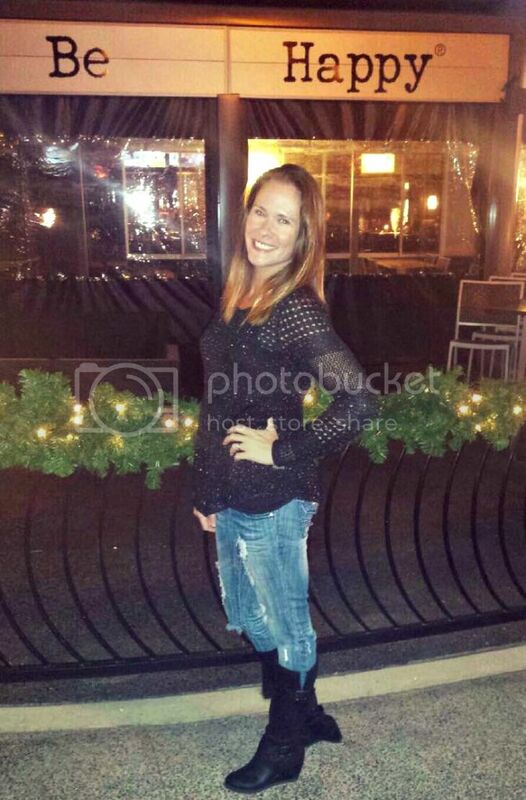 Her name was Katie Jocelyn. She was wearing a grey and red tracksuit. I loved her so much. I'm pretty sure my mom still has her. I have a feeling her clothes are long gone though. So, tell me about your Cabbage Patch Doll. I know you had one. I never had a Cabbage Patch Kid. BUT, I did have some Garbage Pail Kids cards. 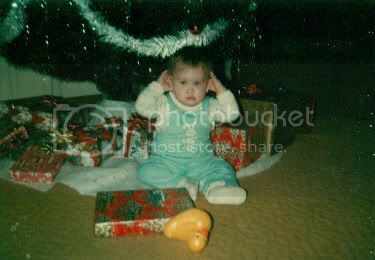 And speaking of babies at Christmas time, I was born on December 19th. They sent me home from the hospital in a giant red stocking with a santa hat on my head. "Hey mom, beats a lump of coal!" 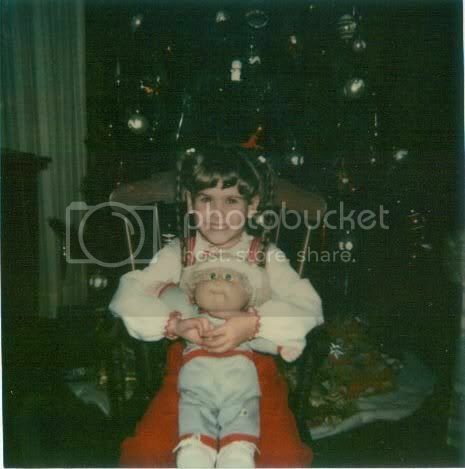 I did not have a cabbage patch doll. I had 2 home-made ones, and those are SO not the same. That's the crap that happens when you're the poor kid. i had SEVERAL CP dolls. but i will never forget that one year santa brought my mom one for christmas. which, i obviously found out my mom bought herself a CP doll. I got a fake Cabbage Patch doll for my birthday and the spoiled brat that I was, I pulled down it's pants, saw no signature and threw it across the room declaring that it was fake! Yes I had 2 of them...and I can't remember their names unfortunately. Apparently I thought that real babies came from the cabbage patch garden to. I was 4 when my sister was born and I begged my parents to take her back to the garden and pick another one out. I had one. A red headed freckled one. My parents waited in line for all of eternity to get it for me. At least that's what they claim. So funny! you think YOU looked like a boy? i was born bald.....and stayed that way until the age of 3. yep. I had a Cabbage Patch doll named Crystal and I went to pre-school and told everyone my name was Crystal too. I had one and it was a surprise from my family. I was SO excited as I was opening the present, but they picked a boy doll and that was NOT cool. Don't they know all little girls like girl dolls? I don't remember his name, but needless to say he was not my constant companion. Also. That first picture you look EXACTLY like Little Bit, no?? We had one but I can't remember his name!! He was just a bald boy! 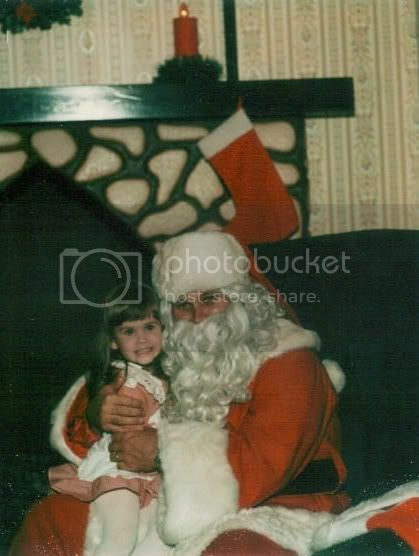 I had 2 - first one I got for Christmas like you did, it was a girl with dark blonde pigtails and a lacey dress... I can't for the life of me remember her name though. The other one I got a few years later was a bald baby boy with blue eyes named Jacob. He came in an orange jumper. Mine was Tay Georgina. She had brown braids and pink glasses. Awwww, what a cute little kid you were! I had a Cabbage Patch Kid, too, but I can't remember much about him except that he had curly hair and I think he wore a football jersey. They were the best! My parents totally dressed me like a boy for ages. My mom was also a fan of the sandals/socks look. THANKS FOR THAT, MOM!!! I have no idea what my CPK was named... For some reason I named it "Almost". I dragged Almost with me everywhere. Anyhooo, she had the same birthday as me, and the same stringy blonde hair and blue eyes! Still have her around here somewhere... She is missing clothes and has aquired some blue ink pen drawings on the forehead. I didnt have a cabbage patch doll because im a boy, however I collected the Garbage Pail Kids cards. Oh I definitely had one, with brown yarn hair that I'd try and try to brush with no success. I was never into CPKs but the museum is here in GA so I suppose it is not too late. lol. And you are adorable in those pics! My grandma made my Cabbage Patch doll. It's still at my moms house and my nieces play with her. She had yellow hair. I have no clue what I named her. Sadly, I don't remember much from my childhood. Especially not the name of my CP doll.